The Rose of the Sea Wiccan Teaching Circle was officially formed on Mabon of 2004. Anja and Fawkes had been working separately, but when they got together, the Wicca 101 class took off and turned into a full curriculum. Very quickly there was a Circle that began to teach and initiate and has been doing so since then. We are from the lineage of Ferion Wicca. Many streams contribute to this eclectic path, but what we teach is Wicca in all its varied forms with a strong flavor of the Anderson F(a)eri(e) tradition. Rose of the Sea holds open Circles on all the Sabbats. The 100-series of classes gives a student the academic learning necessary for first degree and the 200-level for 2nd degree. Anja also teaches various Craft and craft classes at her shop in Waldport, OR. 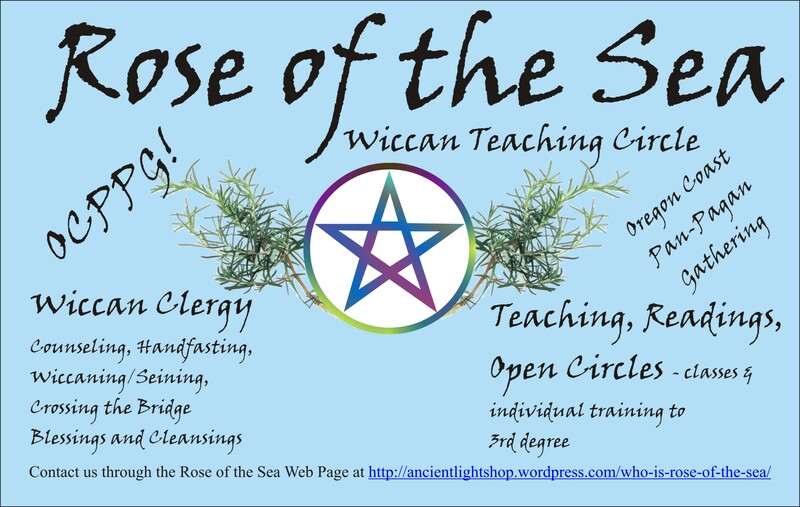 Rose of the Sea sponsors the Oregon Coast Pan-Pagan Gathering, an annual 3-day event of classes, rituals and fun! Anja and Fawkes worked first as 2nd degrees and then 3rd degrees as the leaders of the Circle and then stepped back from the leadership position to function as Elders at the end of 2012, leaving the leaders as Marius, Rowan and Cat. In 2017 the leadership reverted back to Anja with the backup of her husband, Tempus. Contact us here, or inquire privately to anjasnihova@yahoo.com.